Fresh off of winning the University Athletic Association national championship, the Emory men's basketball team will compete in the NCAA Division III Tournament starting on Friday at the Woodruff PE Center. Fresh off of winning the University Athletic Association national championship on Saturday, the Emory men's basketball team will compete in the NCAA Division III Tournament starting on Friday. 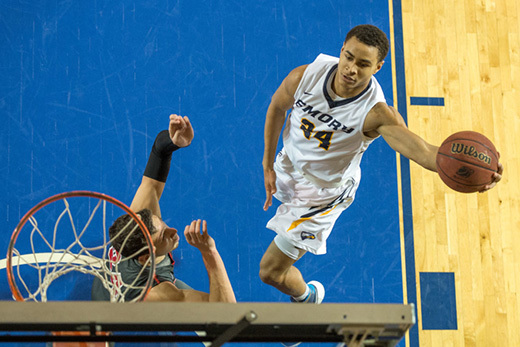 Emory has been tapped as a host site for the opening rounds of NCAA action, so fans of the Emory Eagles can turn out to cheer on the home team on Friday at 7:30 p.m. at the Woodruff PE Center. If Emory wins on Friday, the team plays again at 7 p.m. Saturday here. Live statistics and a video stream will be provided for the games. For more information about the NCAA games at Emory, please click here. The Eagles are one of 62 programs competing for the national title. Joining Emory for this weekend's action will be LaGrange College, Birmingham Southern College and the Eagles' opening-round foe, Covenant College. Emory holds an all-time record of 6-0 vs. Covenant College. The Eagles and Scots met earlier this year (Dec. 30) with Emory prevailing by a 76-63 count at the Woodruff PE Center. Tickets are available at the door (cash only). Costs are $10 general admission; $5 for students with ID, seniors and children ages 2-12; and free for children under 2. The first 75 students in attendance will also get in free. The arena will open one hour before games begin. Learn more at Emory Athletics. Leading the Emory program is ninth-year head coach Jason Zimmerman. During his tenure with the Eagles, he ranks as the program's winningest coach. He has guided Emory to seven straight winning seasons and four consecutive NCAA Tournament appearances (2013-2016). Senior Davis Rao scored a season-high 25 points in helping the Emory men's basketball team to a University Athletic Association title-clinching win at Rochester on Feb. 27. The Eagles earned the league's automatic berth to the NCAA Division III Tournament and raised their overall record to 18-7, 11-3 in the league, following an 84-75 decision over Rochester, who slipped to 17-8 overall while closing out conference action at 10-4. Emory finished the game hitting 50 percent (26 of 52) from the field compared to Rochester's showing of 37.3 percent (22 of 59). It was the ninth time this year the Eagles held an opponent to less than 40 percent from the floor, upping their record to 8-1 in such games. Three-point shooting was a key factor in the final decision, with Emory successful on 44 percent (11 of 25), while the hosts struggled at 23.8 percent (5 of 21). It is Emory's second straight UAA title and third in the past four years (the 2012-13 squad tied for the league crown). Overall, it is the fifth time that the Eagles have been league champs.